A group looks to replicate the success of a 1987 referendum to limit redevelopment, which it calls a 'death knell for the fishing people' and others who need water access. Portland residents are once again organizing to force a citywide vote to block non-marine development along the working waterfront, filing initial paperwork at City Hall on Friday afternoon. 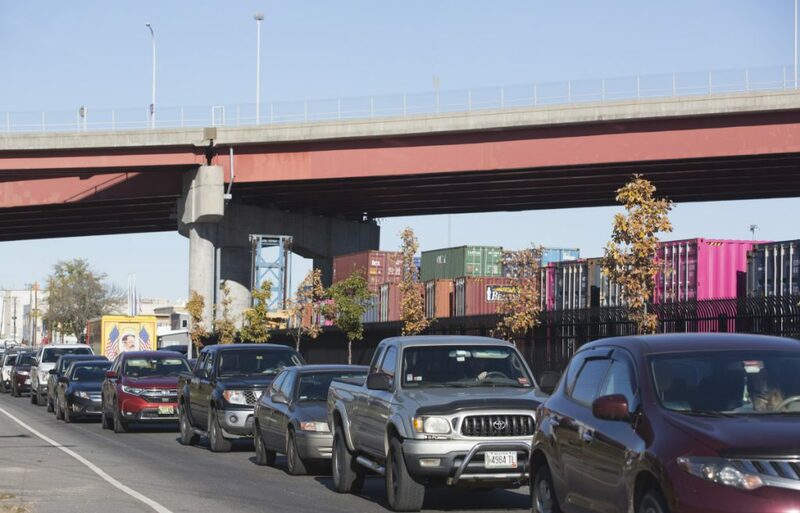 The citizens initiative would make sweeping changes to land-use rules governing three sections of the waterfront, spanning from the Eastern Promenade to Veterans Memorial Bridge. The proposal would further restrict uses that don’t rely on water access and narrow the scope of contract and conditional rezoning options that could be used to expand development options. West End resident Orlando Delogu said he is part of a “coalition of working waterfront people” drafting a proposal, which would roll back a 2010 City Council decision to relax restrictions that were designed to protect commercial fishermen and other water-dependent uses from being squeezed out of the Waterfront Central Zone. Uses such as offices, restaurants, hotels and condominiums, Delogu said, are a “death knell for the fishing people” and others who need access to the water. He said 97 percent of the area is open for non-marine uses and only 3 percent of the city is zoned for waterfront uses, such as commercial fishing operations. “They can’t be out on Forest Avenue or Monument Square,” Delogu said of the fishermen. Delogu and others in the group are certain to face intense resistance from developers and waterfront property owners, who say they need mixed uses on the waterfront to pay for maintenance of the aging piers. A spokesman for one developer who has submitted plans to build a hotel on the waterfront said proponents of the restrictions have been grandstanding and whipping up publicity while property owners have, so far, not responded. Fishing boats are docked along the waterfront in 2013. The new push for a citizens initiative echoes the successful campaign in the late ’80s to limit Portland’s central waterfront to water-dependent uses like commercial fishing. The measure, which would be retroactive to Oct. 26, comes as Portland is undergoing a development boom of luxury condominiums, hotels and office buildings. The pace of redevelopment has not been seen since the rebuilding efforts that followed Portland’s Great Fire of 1866. The referendum effort could lead to a replay of a similar citizens initiative more than 30 years ago that prompted the city to restrict the central waterfront to water-dependent uses, such as commercial fishing and processing. The central waterfront zone encompasses the water side of Commercial Street from the International Marine Terminal to the Maine State Pier. The group of citizens who led the successful citywide referendum in 1987 to block non-marine development were motivated by the construction of then newly built Chandlers Wharf condominiums and two other proposed projects: a 300-unit condo, retail and marina project on the eastern waterfront and an office complex on Fisherman’s Wharf. Despite being opposed by seven of the nine city councilors and the local chamber of commerce, the citizens initiative passed by a 2-1 margin. “We could just see that the city was salivating then, just like it’s salivating now over upscale development right on the waterfront,” said Delogu, who drafted both the 1987 initiative and the current one. 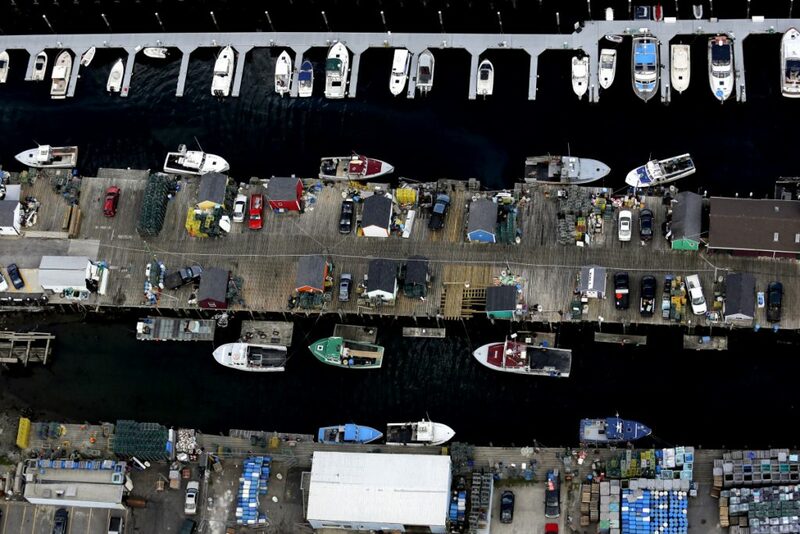 In recent years, fishermen say they have been feeling the squeeze as pier owners and real estate developers began taking advantage of the council’s 2010 zoning changes. Traffic backs up Friday on Commercial Street along Portland’s waterfront. West End resident Orlando Delogu says that only 3 percent of the city is now zoned for waterfront uses such as fishing. The new overlay zone relaxed restrictions on the water side of Commercial Street, although not on any of the 13 piers in the zone. The overlay zone extends as much as 500 feet from Commercial Street to include parking lots between Union Wharf and Long Wharf. The zoning was relaxed to accommodate pier owners, who argued that non-marine uses are the only way to generate revenue they need to maintain the piers for the fishermen. Maine Wharf, near the Maine State Pier, was redeveloped in 2014. City officials allowed a restaurant to open there, after the developer proved that he had unsuccessfully marketed it for marine use. 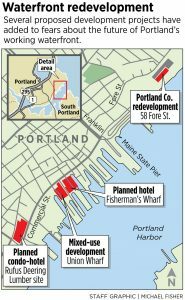 While only one other new office building has been built within the overlay zone, developer David Bateman has proposed a four-story hotel, retail and office complex with a parking garage at Fisherman’s Wharf, a property currently comprised of surface parking lots and the popular Portland Lobster Co. restaurant. Mark Robinson, a spokesperson for Bateman Partners, said Friday that local pier owners have so far remained silent about the “grandstanding on this non-issue.” However, he doesn’t anticipate that silence to continue. 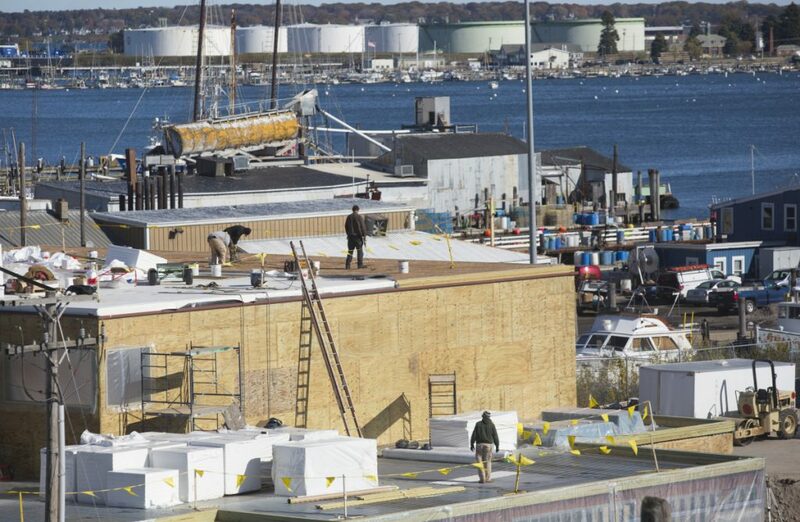 In addition to Bateman’s project, fishermen have expressed concerns about the Rufus Deering Lumber Co. site, which has been approved for redevelopment into a mixed use hotel and condominium project and the redevelopment of the Hamilton Marine site at 100 Fore St., a proposal that includes a 600-vehicle garage that is currently being reviewed by planners. Advocates on Friday satisfied the first step in the citizens initiative by providing the signatures and addresses of a 10-member petition committee. The city has seven days to conduct a legal review of the proposal and provide advocates with petitions. Advocates will then have 80 days to collect 1,500 signatures from registered voters. If that occurs, the proposal will receive a public hearing before the City Council, which must decide whether to enact the ordinance, put it out to voters, or put it out to voters along with a competing ordinance. If approved at the ballot box, the ordinance could not be changed by the city for five years.